I won't post anything until the day. In the meantime, I'm just quoting this for those I love. The main purpose of my Jakarta visit this Christmas was for visiting our families particularly visiting my father and father-in-law graves, who both passed away before they met their granddaughter, Kezia. I took some notes in my mind for what I had been seeing in three weeks there. NZD100 is supposed to be more than Rp600,000 but I prefer to see it as Rp300,000. No economic value theory supports this analogy, this is only my own respect in how to value money in Jakarta and compare it with Wellington as I feel it's worth it. This roughly equals to USD70. So I use my own rate here, 1USD=Rp4,300 and 1NZD=Rp3,000. My first hate was when I spent Rp100,000 (33 bucks) for 22 litres premium petrol. With 33 bucks, I could also buy 22 litres unleaded (91 octane) in NZ and drove my car on the best quality roads and traffics. No stressful driving atmosphere. Say that I earn Rp5 million a month, if I spend Rp100,000 a day commuting to my office and return, there is a transportation cost of Rp2 million a month. Kill me! Motorcyclists often tooted their horns from behind asking for their space to overtake. This was a crazy way that I never managed to ignore because I was just affraid to crash them. They just suddenly came up from my left or right. They had a very short visibility as they could find a small space to suit their motorcycles in the middle of traffic. I found there might have been an increasing motorcycle users in Jakarta. Particularly because of the price of a motorcycle is so cheap and with very low down payment. It has a low running cost as well. Something that I found it's still the same from time to time is the chaotic public vehicles behaviour. I can understand that as the drivers were chasing their target of income. No wages or salaries here. We tried to go shopping for groceries as we normally do in NZ. We spent Rp600,000 at Giant the closest supermarket from our home. Using my exchange rate, it's 200 kiwi bucks, the same amount with our grocery expense in NZ. I felt something wrong in the economy, or just my exchange rate is outrageous, beyond the normal economic morality. Who said that 1USD=Rp4,300 is immoral? These two cars were often seen in Jakarta's roads and car parks. Toyota Avanza is just around Rp100 million but giving much more utility to the users as it's low running cost (1,300 cc) and a 7-seater car, suits for family car. While Honda Jazz is just Rp125 million, low running cost, more stylish and suits couple or single driver. Money consciousness, I think, is the reason to buy these cars. One time I had no internet access as a result of Taiwan's earthquake. I couldn't log in to internet banking to pay my bills and amend my automatic payment, and also to retrieve my emails. Super Milyader 3 Milyar is an ANTV programme which imitates "Who Wants to Be a Millionare" to win USD1 million. Using the normal exchange rate, USD1 million roughly equals to Rp 9 billion. Why Rp 3 billion? Can you see USD1=Rp3,000? Say that we live in Jakarta and try to calculate our monthly budget. Finding this, I asked myself: is it worth it to spend Rp6,500,000 a month in Jakarta? No, it is not really worth it. Remember to put USD1=Rp4,300 in mind, you would think that it would be better if you live overseas. I wrote this for fellow immigrants from Indonesia who live in OECD countries. You may find it's not worth it with what you're having now, but when you come back you'll find even more not worth it. With a same value of spending you're getting the upgraded atmosphere. However, something that has no value and price is meeting your relatives and friends. Cheers. One note from my visit to Jakarta. 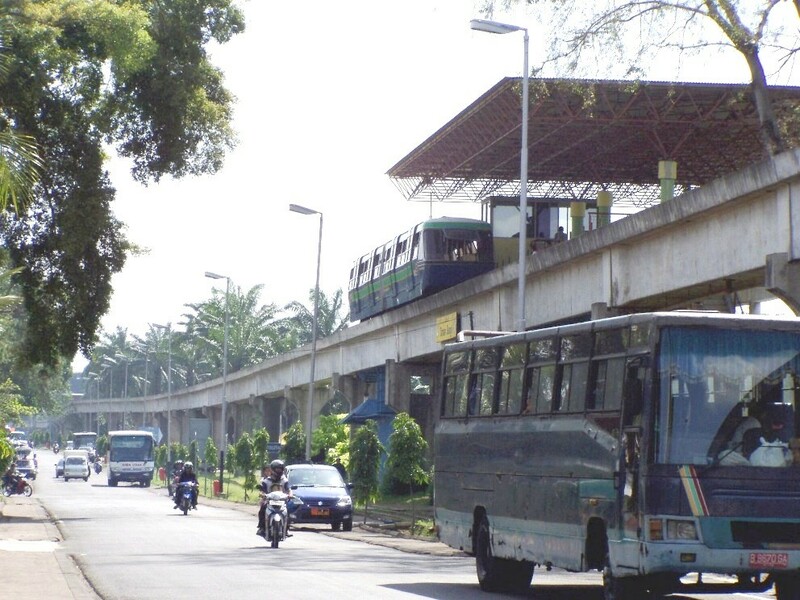 Before the dream of the Jakarta Monorail comes true, it's good to see the real one. 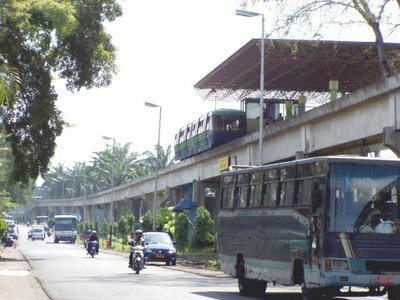 The old version of the Jakarta Monorail has been operated for years in this area. Guess, where about is it? Right, in Taman Mini Indonesia Indah. It has been there since 1989. This monorail system was built by AEROMOVEL. The AEROMOVEL® system is located within the recreational theme complex, Taman Mini Indonesia Indah, in Jakarta, Indonesia. This system has carried more than three million passengers over the last nine years. The system consists of a single track elevated guideway connecting six passenger stations along a 3.2km (2mi) loop. Three single-articulated vehicles operate in the line simultaneously. Each vehicle consists of two compartments with full internal access. Two vehicles were designed to carry 104 seated passengers and the third one was designed for 48 seated and 252 standing passengers. Click the image to see it moving.